£50, £75 and £100 packages available. 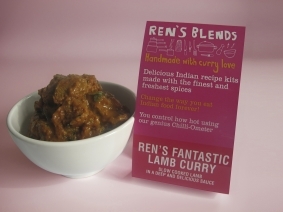 Ideal gift for curry lovers! Our mouth-watering range of starters are quick and easy to prepare, and perfect for any occasion, or even as a meal in itself! All our starters incorporate our genius Chilli-Ometer so you can decide how hot or how mild you make each dish. 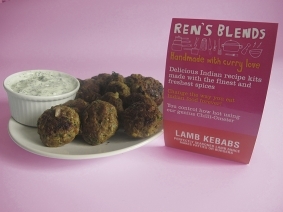 Mouth-watering lamb kebabs, seasoned with our special homemade blend and packed full of flavour. Quick and very simple to cook. 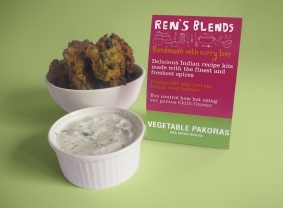 These kebabs are so versatile – make them into small patties as a starter and serve with a delicious chutney or as burgers tucked into pitta pockets with salad. 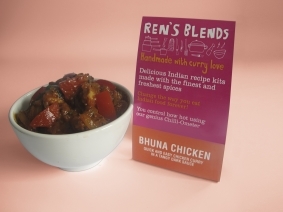 Chicken wings cooked with the distinctive flavour of our wonderful fresh cumin and spring onion. This authentic dish is a favourite starter! Serve with a refreshing, tangy tomato and onion salad and Indian breads. 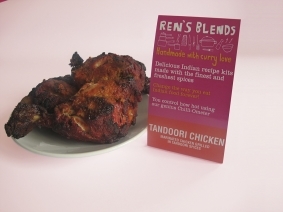 Our version of this classic dish contains our wonderful fresh and fragrant spices to make the most flavoured and succulent tandoori chicken you've ever tasted! 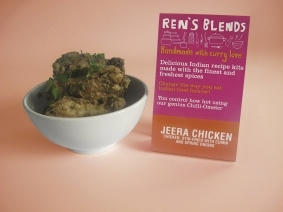 Serve with a piquant onion salad and Indian breads, you will be licking your fingers clean! AKA onions bhajis! These irresistible fritters are the perfect way to start your meal and homemade ones are so much tastier! 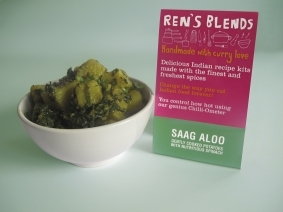 Enjoy with your choice of chutney while they are hot, you will be fighting over the last one! Our fabulous selection of mains contain a delicious choice of meat, fish and vegetable dishes. With our genius Chilli-Ometer you can decide how hot or how mild you make each dish. This dish is simply divine! Small pieces of boneless chicken with our wonderful fresh, fragrant spices and layers of onion and tomato in an easy to follow recipe. Definitely the quickest way to get a curry fix! 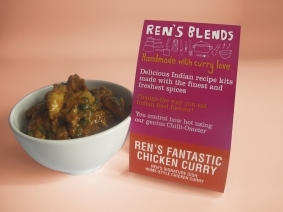 This curry is Ren's signature dish – a totally authentic and homestyle chicken curry made with our wonderful fresh spices and lots of tender curry love. Fantastic is just an understatement! Robust and full-bodied lamb dish to be slow cooked when you have a little time on your hands. The result is a deep and delicious lamb curry. Sheer pleasure! A traditional vegetable dish of gently cooked potatoes combined with nutritious spinach – a healthy and light dish which is quick and easy to cook. It's much more than just a bit on the side! 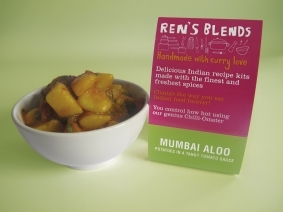 Our version of the renowned Bombay Potatoes dish! Colourful and hearty in a delicious, tangy tomato sauce, this dish will delight your taste buds! 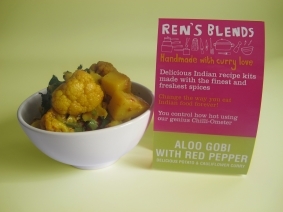 A tasty and appealing combination of nutritious vegetables, cooked in our special blend of fresh spices - never have potatoes and cauliflower been more exciting! A popular vegetarian choice, this dish is not only wholesome and nutritious, it is flavoursome and delicious! 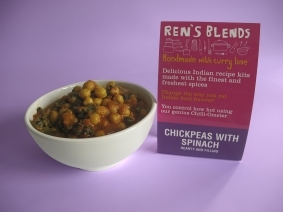 Enjoy this hearty chickpea dish with Indian breads. A fragrant and deep flavoured fish curry, with both sweet and sour notes and the delicate flavour of coconut. 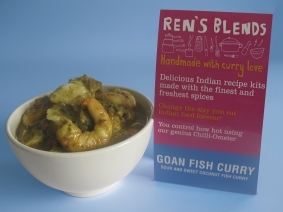 This curry is layered with texture and can be made with a firm white fish, prawns or an adventurous combination of both. A true favourite with our students! 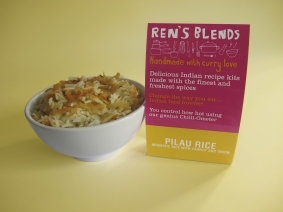 Our Pilau Rice is quick and easy to cook and is the perfect accompaniment to our dishes. Plain rice will become history! Give it a try – it will truly transform your meal! Buy with: All Our Dishes!